I haven’t written a real post in quite a while. My days are busy and spent staring at the computer screen for hours on end and the last thing I want to do after I’m done making dinner is stare at the screen some more. And that’s assuming I take pictures of the food I make for dinner! Anyway, I’m trying something new this week. Creating a theme for everyday posts just for you—my five readers! Today we’re back with Meatless Monday (remember when we had some adventures in tofu a while back?) Tonight’s recipe is for the potato and cheese lovers. I stole this recipe from Food Network (I’ve bashed the magazine before for its inconsistency in recipes). Their recipes seem to be hit or miss and I’m happy to report that this one is a definite hit. It takes a while to make—almost two hours from start to finish—so plan accordingly. I recommend getting a mandoline to slice the taters on. I’ve done this by hand and by nifty slicer and the mandoline saves so much time and makes everything even. Pair this cheesy dish with a big salad. Go the Greek route, the Caesar route, or make a sweet/savory salad with pears, gorgonzola, craisins, walnuts and a honey dressing. 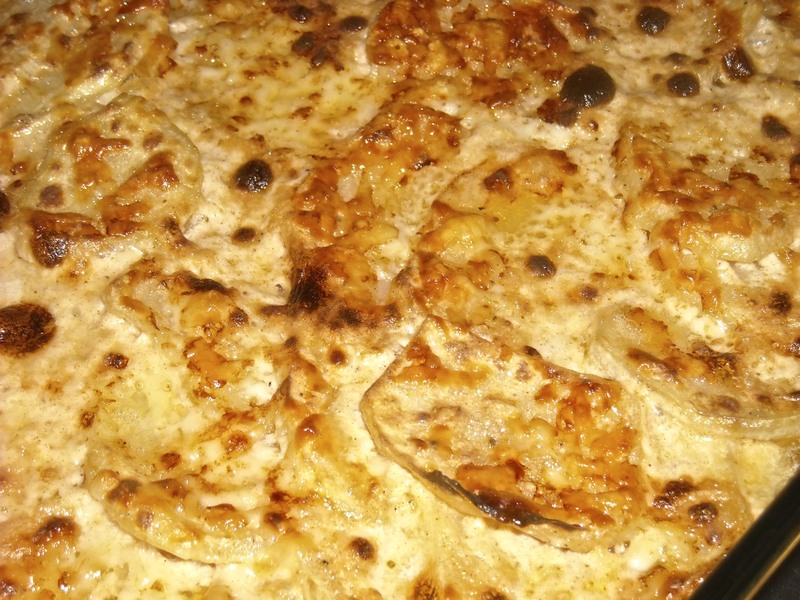 Smoky Scalloped Potatoes from Food Network Magazine, November 2011 Issue. Butter a 9-by-13-inch baking dish with 1 Tbsp. butter. Melt the remaining 2 Tbsp. butter in a large saucepan. 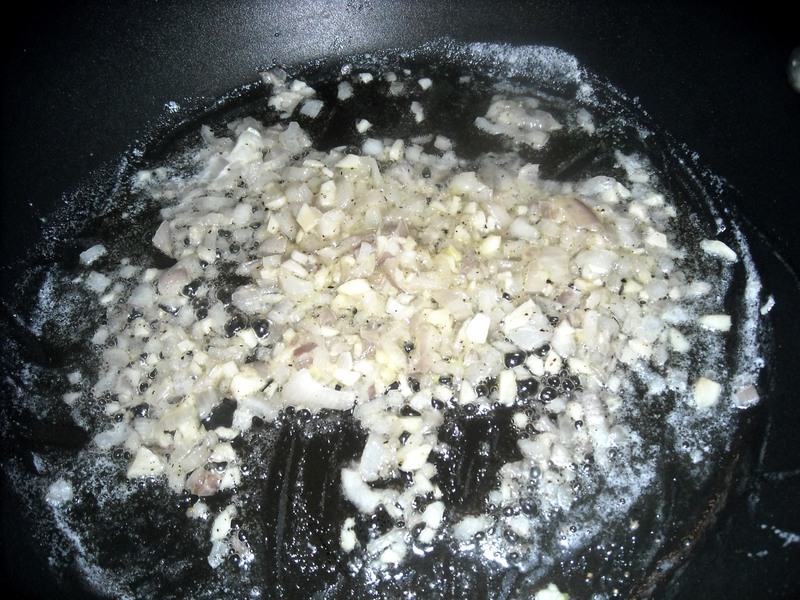 Once the butter foams, add the shallot and garlic and saute until softened–about 5 minutes. Does anything smell better than shallots and garlic cooking in butter? Me thinks not. Add the flour and cook, stirring frequently, until golden, about 2 minutes. Season with salt and pepper. Add the half-and-half, smoked paprika and potatoes. Bring to a low simmer and cook for 5 minutes. Carefully pour half the potato mixture into the buttered baking dish. Shake the pan to arrange the taters in a single layer. Sprinkle half of each cheese on top of the layer, then add the remaining potatoes and shake again to arrange in a layer. Sprinkle the rest of the cheese on the top of that layer. *I broiled my potatoes for the last fifteen. They weren’t getting browned enough just by baking. **As hard as it is, you should definitely let the potatoes sit. It’s a runny mess if you don’t let them cool, first. 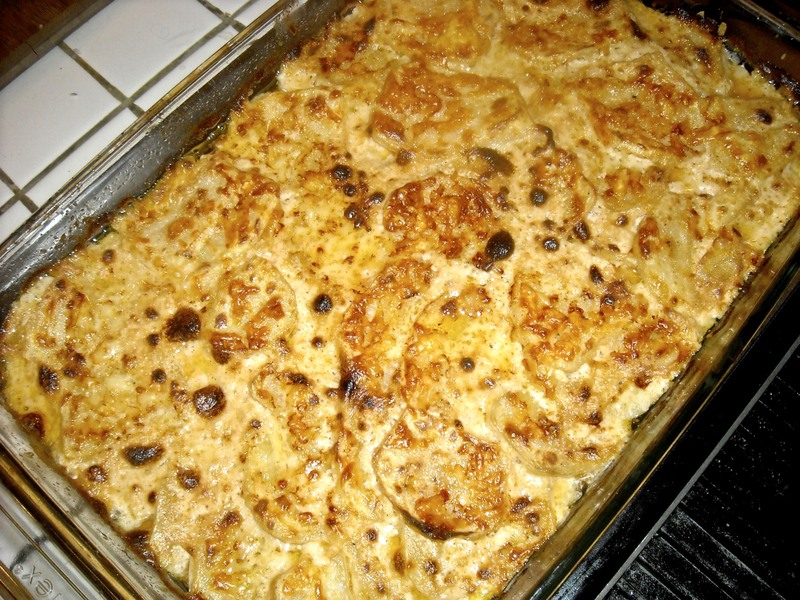 Anyone here love scalloped potatoes? Anyone think of seafood when they hear the word scalloped? Check out tomorrow’s new theme: Tasty Tip Tuesday! This is awesome, I love your take on Vegies and fruit, I’ve been forced to leave off a lot of food in the dairy ,pork, oils and such because of my cholesterol so turning to vegies have been good for me, I am enjoying my new life and way of eating, Thanks so much for all you do!! 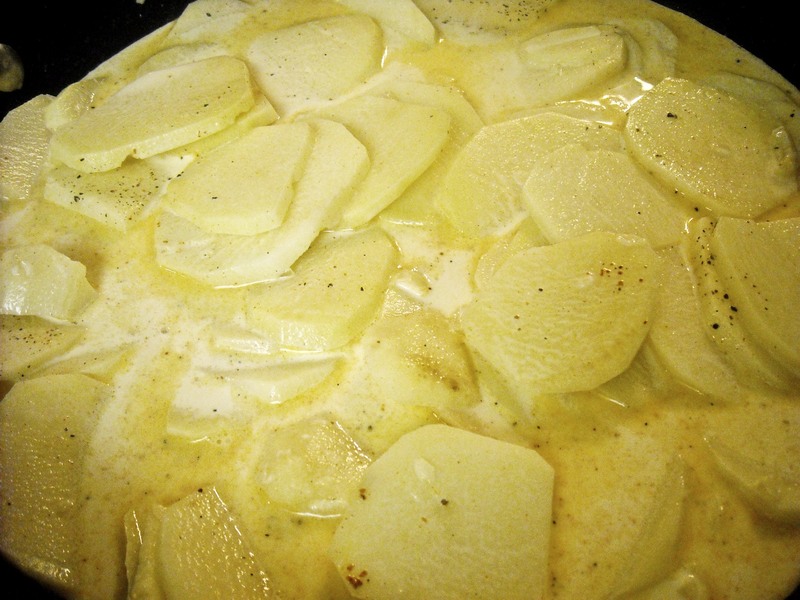 Oh my goodness, Ben and I love scalloped potatoes! Those look delicious! We will have to make them soon! Pammy–they’re so easy! And feel free to omit the the smoked paprika (it can be expensive) and play around with the types of cheese you use! Melissa!!! I am from the “potato queen” family and these look amazing!!! Will you help me make them for a dinner over the holidays???? ugh! they look sooo good! Favorite combo – potatoes and cheeeeese!!!! yum!